Iceland hosts three trail races where runners can earn points to qualify for the famous Ultra-Trail du Mont-Blanc (UTMB). These trail races take place in June and July. The Laugavegur Ultra Marathon is the best know ultra trail race in Iceland. 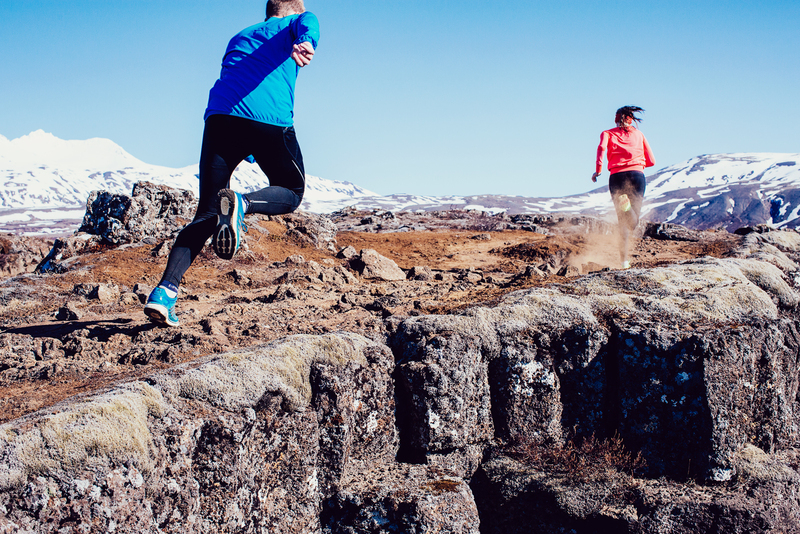 It is a 55km trail run along one of the most beautiful and popular hiking trail in Iceland. It starts in the lava at Landmannalaugar and goes up and down hills and mountains, across rivers, past glaciers, over sands and into the woods in beautiful Þórsmörk where the run ends. The breathtaking landscape could not be more varied. The total climb is about 1,900 meters and total descent is 2,200 meters. The race is held in mid-July and had 361 finishers 2015. The Hengill Ultra trail run takes its name from the Hengill volcano, which last erupted about 2000 years ago but is still considered an active volcano. The race offers three distances: 81km (50 miles), 50km and 24km. The 81km race is the longest ultra marathon held in Iceland. All distances begin and end in Hveragerði, a small village famous for its hot springs, 40 km from Reykjavik. The landscape is stunning with valleys and mountains, muddy roads, rivers, hot springs. There are also some very steep hills with the mountain Skeggi (810 m) the highest point. The race is held at the end of July and the longest distance had 5 finishers in 2015. In the middle of June the Mt. Esja Ultra race takes place, offering three distances: 14 km, 42.2 km and 77 km. Participants in the 77 km race run a 7 km loop 11 times, with a total elevation gain of 6,600m. The 7 km loop is run twice in the 14km race distance. Total elevation gain in the Mt. Esja marathon is 3,500m and it is the only mountain marathon held in Iceland. The marathon had 13 finishers in 2015 and the 77km ultra race had 5 finishers.